I’ve read several books and articles about Alan Turing, my favourite being The Annotated Turing. This book walks you through his seminal work On Computable Numbers (PDF). The first biography about him that I read was Enigma, by his ‘official’ biographer, Andrew Hodges. This is probably the authoritative, definitive biography on Turing. He acted as consultant to the movie The Imitation Game, which I watched recently. As I’m late to the game, I’m not going to go into great detail about it, because others already have done a pretty good job (see list below). For example, here’s the Wikipedia list of some of the inaccuracies. And I don’t think that list is particularly comprehensive. From other articles on the web, I suspect there may be twice as many more errors as listed in Wikipedia. So my purpose here is mainly to give you the TL;DR (executive summary). You could also try Googling this article’s title, because using the word imitation twice in the title was also obvious to other authours. Turing’s character wasn’t as obnoxious as portrayed. Yes, he was occasionally rude and arrogant, but most people liked him. He was never suspected of being a Soviet spy. His arrest happened in 1952, not 1951 in connection with a burglary, which led to his being found out as a homosexual. He didn’t work with John Cairncross, and they probably never even met. He didn’t suddenly realise the technique of looking for standard or repeated phrases (cribs) and then rush over to his machine and break Enigma within minutes. His ‘Christopher’ machine was a Bombe named Victory, initially inspired by Polish work, and with the help of Gordon Welchman. Allowing the Germans to attack a convoy with the brother of one of the cryptographers in it, never happened (the brother didn’t exist). Such decisions were taken at a much higher level. Turing didn’t write to Churchill to persuade him to put him in charge of the project. He wrote to ask for more resources, which Churchill granted. His chemical castration wasn’t as debilitating as portrayed, didn’t last until his alleged suicide, and Joan Clarke didn’t visit him at his home. His conflict with Denniston appears to be totally fictional. Some of the scenes are disgustingly Hollywood cartoonish. I was particularly amused/saddened at the scene where he’s drinking with the other cryptographers, and somebody says something which makes him realise that people sometimes communicate with standard phrases, such as ‘Heil Hitler’. So a gang of them rush over to the hut, and test the hypothesis; it’s validated on existing data, so now they set it up in the Bombe on a new message, and discover an impending attack on a British convoy. All in a short space of time. And Turing says they shouldn’t alert the convoy because then the Germans would realise their Enigma system had been cracked. So this other guy punches Turing out. Well Hollywood, gangs rushing about and brawling blokes coming to fisticuffs might be how you do things over there, but I can assure you, it’s not how educated Brits of his generation (the one just before mine) did things. I know this movie and Benedict Cumberbatch have received many accolodes, but frankly I was very disappointed. I would have hoped that an actor of BC’s calibre would have researched and realised that he was not actually being asked to portray Alan Turing, and demanded that the movie should be more faithful to Turing’s memory. 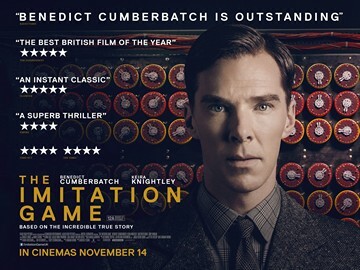 I know, movies aren’t documentaries, you expect some adaptation of the historical facts for entertainment value, but this one does Alan Turing a gross disservice. And I’m surprised and disappointed that his so-called biographer put his name to this piece of nonsense.